At the dawn of the 1970s, ‘going electric’ had become commonplace for jazz musicians; ‘going electronic’ was a different matter. Many musicians plugged in, filtered and distorted their keyboards, basses and horns, reaching for an unholy, ecstatic din or the youthful muscularity of the groove, but few wholeheartedly embraced the abstract space of studio electronics or took up the challenge of how to improvise with them. Enter Don Cherry, who, if anyone, was well-suited to the task of combining improvisation and electronics. Cherry had spent the better part of a decade fleshing out Ornette Coleman’s approach to collective composition, and he had also started to build his own vision, one in which whole musical styles and cultures merged and themselves became modes around which to improvise. This adventurous spirit led to an invitation to act as artist-in-residence at Dartmouth College. The invitation came from Jon Appleton, himself a composer and, more importantly, the builder of the college’s electronic music studio. Their collaboration over a two-week period in February 1970 gave us Human Music, originally released on producer Bob Thiele’s Flying Dutchman imprint, and now re-issued by Water. Electronic space is something we today conceive of as hyper-flexible, a highly malleable dimension where everything becomes a texture, a timbre, where music gives up its cultural signifiers and becomes mere sound. So with Cherry on board and Appleton at the controls, all the ingredients for what we could call one of the founding documents of electro-acoustic improvisation were present; in this case, though, rough prototype might be more apt. 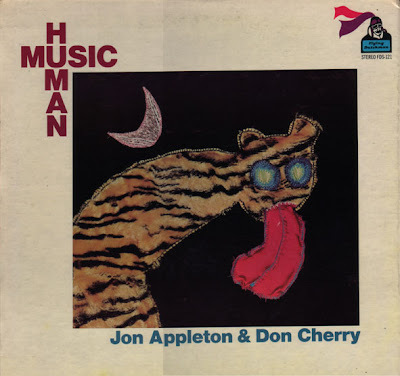 For one, the interaction between man (Cherry and his pocket trumpet, kalimba, hand percussion and voice) and machine (Appleton’s use of Robert Moog’s wall-system synthesizer) produces very little flow. The motion is stop and start, with Cherry producing sounds that soon receive a reply from Appleton’s set-up. 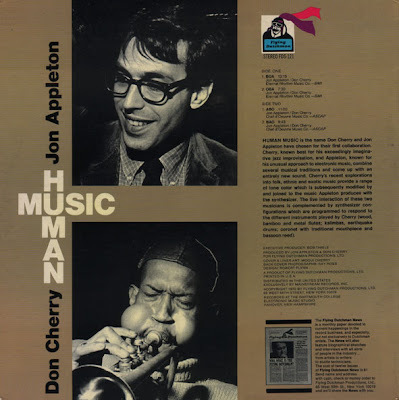 The liner notes tell us that Appleton’s electronics were triggered by what Cherry played. This results in dialogue that feels one-way, such as on “Oba”, where Cherry produces cascades of half-melodies on his trumpet and the electronics shadow his playing, adding layers of effects, but the layers are oil and water, not a compound. On “Abo” a sonic compound does appear, with Cherry’s kalimba, flute and manipulated vocalizations blending with Appleton’s erratic signals, pitch-bends and accents. Here the essentials of improvisation - give-and-take, transformative dialogue and the unifying of diverse voices – appear, and the use of electronics to achieve those essentials bears fruit. Unfortunately, on Human Music, this synthesis is often lacking, and it seems that Cherry and Appleton’s ideas outstripped their technology, and their execution. Awesome upload, been looking for this for a while! I'll second what Keef said: Please sir, can we have just one more shot at it? I'll 'third' it! I'd love to hear this! Another hearty vote for a re-upload... This is massively hard to find. could you post it again ?